Hi friends! So excited about today’s post as it’s a skincare post and I just love sharing the new products I am loving and using in my routine. 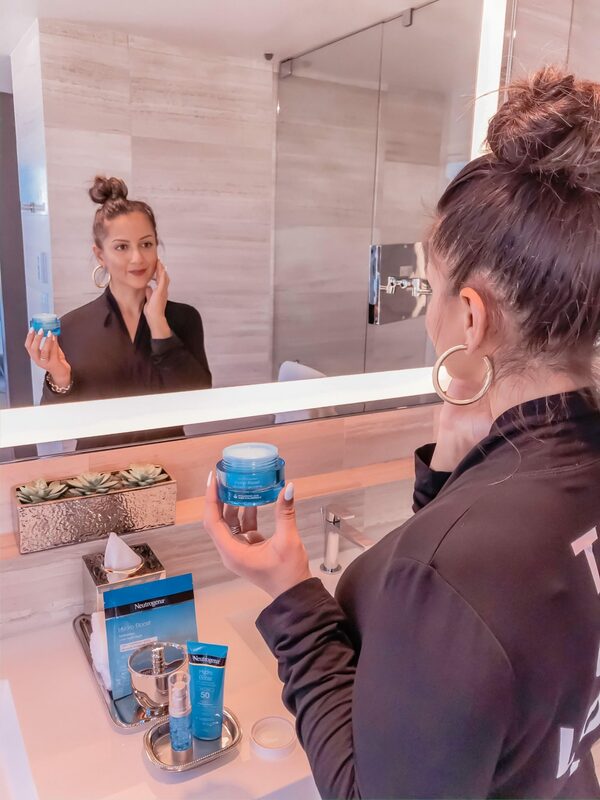 As you all know, I love Neutrogena® and have been using their products in my morning and night skincare routine for a long time. Recently, I started incorporating the Hydro Boost Multivitamin Booster in my routine and it’s made a huge difference with my skin! For some reason, I was always afraid to add a serum to my routine because I thought they would make my skin oily, sticky or they would be out of my budget. 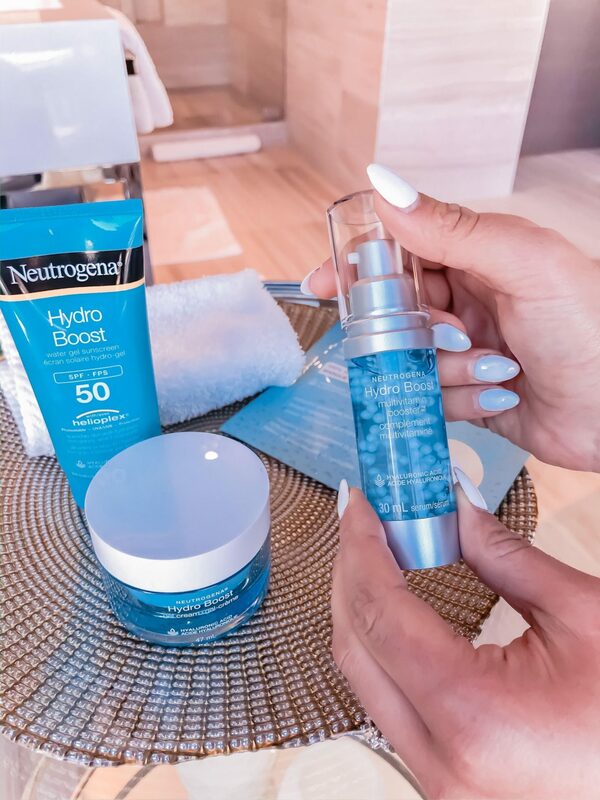 The NEUTROGENA® Hydro Boost Multivitamin Booster is a Hyaluronic Acid + Multivitamin Complex serum that energizes and brightens the look of dull, tired skin. You can instantly feel it go to work as you apply it to your face. Especially now with the cold weather coming in, our skin needs moisture more than ever! You can use it alone or combine it with your favorite Neutrogena® Hydro Boost moisturizer (I use the gel cream). It’s one of those things that after you use it you wonder how you went so long without it! The NEUTROGENA® Hydro Boost Gel Cream has been a lifesaver for my skin this fall. As soon as the weather turns, my skin gets super dry. It’s very lightweight and absorbs quickly and I also notice that my makeup applies much better and more evenly when I use it. Did you know that you should be using sunscreen year-round? The sun is strong even when it’s not sunny out! UVA rays penetrate deep in your skin and can cause skin ageing and even skin cancer. 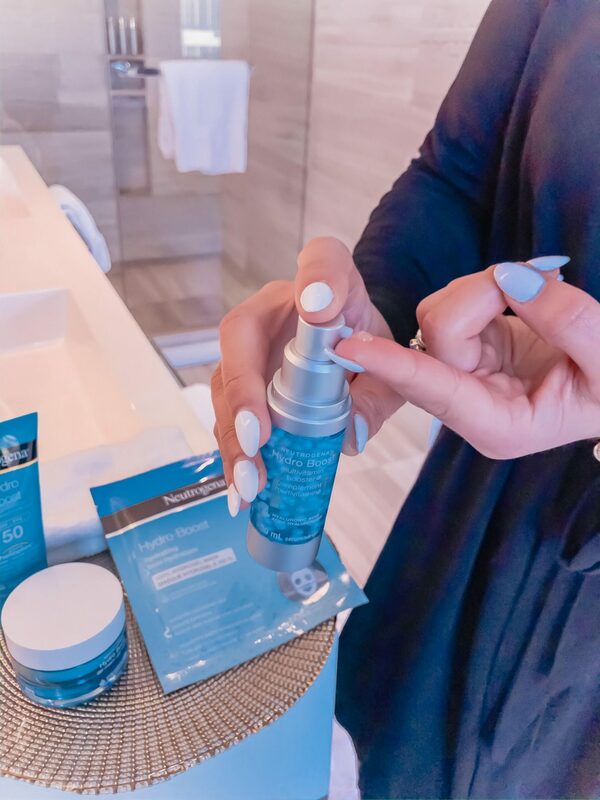 I have been using the Neutrogena® Hydro Boost Water Gel Sunscreen SPF 50 in my daily skincare routine and love how quickly it absorbs into my skin and instantly quenches dry skin while providing protection. One of the best ways to relax after a long day is with a face mask. 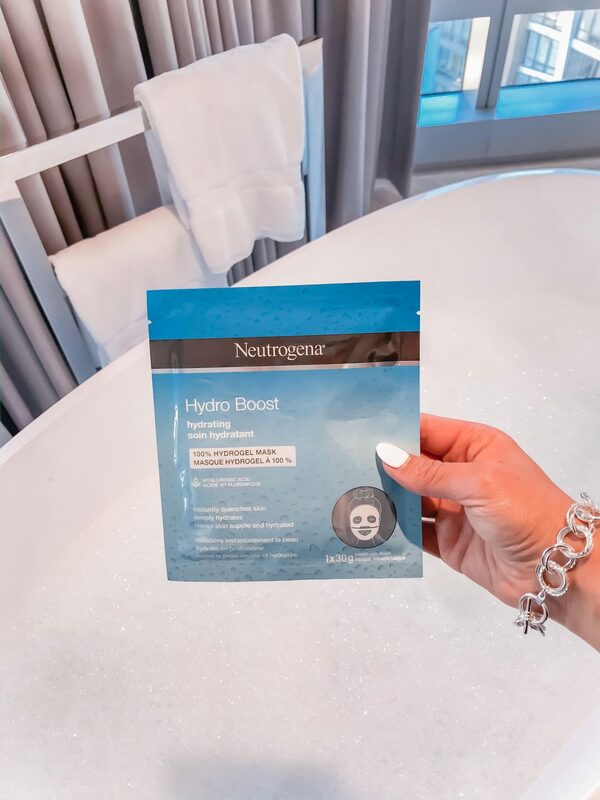 I love to use the NEUTROGENA® Hydro Boost Hydrating Hydrogel Mask that instantly leaves your skin feeling hydrated, smooth and supple. Make sure your skin is clean and leave it on for 15 minutes while you enjoy a glass of wine or tea, with a bubble bath or simply lay down and relax! 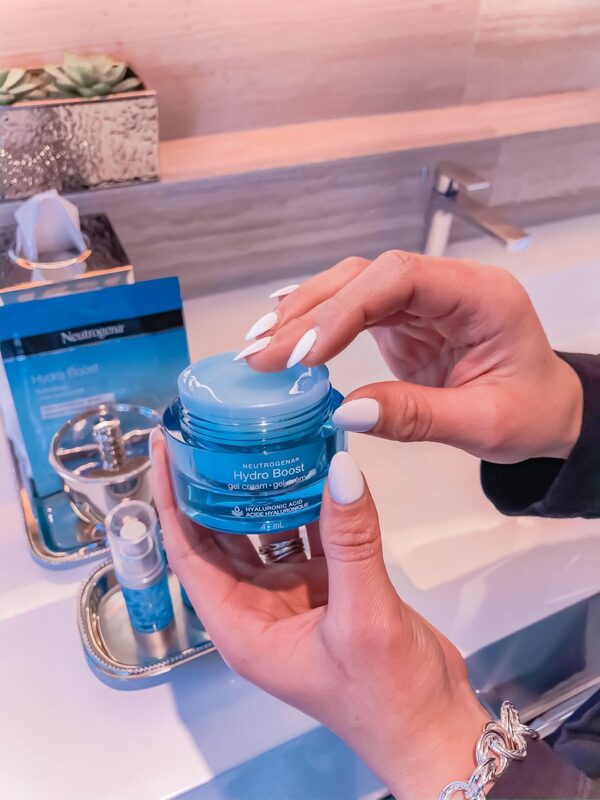 After you remove the mask, massage the remaining product onto your face and neck and follow with the Neutrogena® Hydro Boost Multivitamin Booster and Gel Cream for an extra boost of hydration. I especially love doing this ritual before a big event, so my skin is glowing the next morning! Aside from a great skincare routine, be sure to drink lots of fluids like lemon water and tea as well as get 7-8 hours of sleep each night! Your skin will thank you! 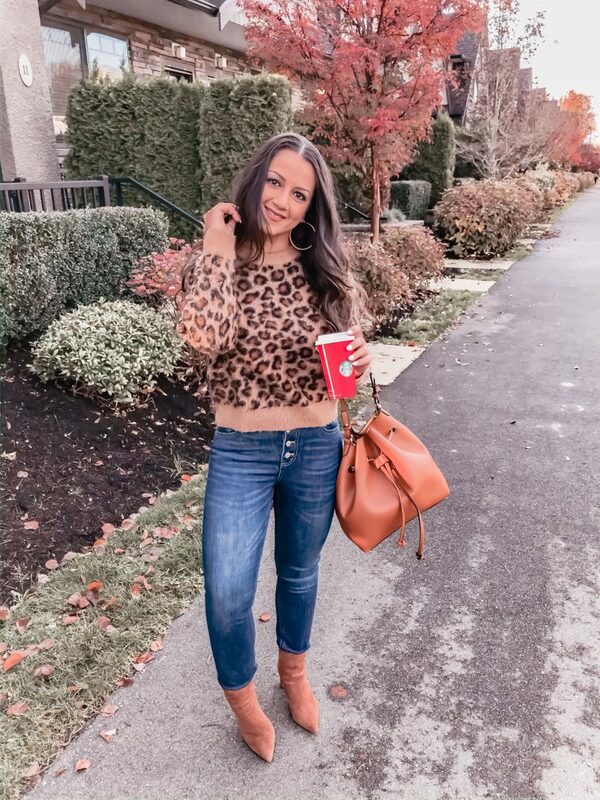 Next Post My Christmas Bucket List + Huge Giveaway!